Human M-CSF, His Tag (MCF-H5247) is expressed from human 293 cells (HEK293). It contains AA Glu 33 - Arg 255 (Accession # P09603-1). 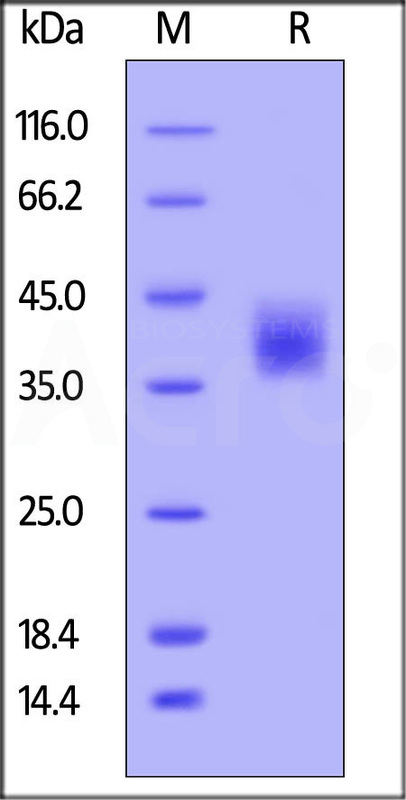 The protein has a calculated MW of 26 kDa. The protein migrates as 36-45 kDa under reducing (R) condition (SDS-PAGE) due to glycosylation. Human M-CSF, His Tag on SDS-PAGE under reducing (R) condition. The gel was stained overnight with Coomassie Blue. The purity of the protein is greater than 95%. Immobilized Human M-CSF, His Tag (Cat. No. 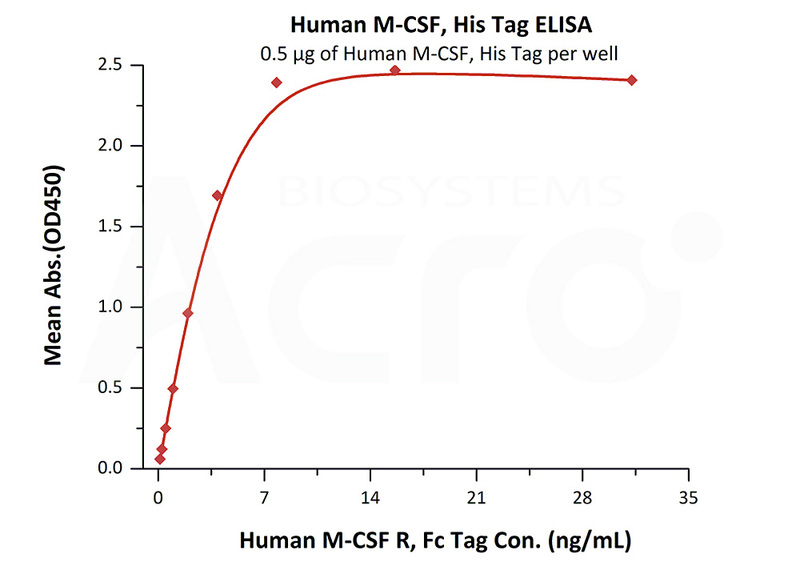 MCF-H5247) at 5 μg/mL (100 μL/well) can bind Human M-CSF R, Fc Tag (Cat. No. CSR-H5258) with a linear range of 0.1-4 ng/mL (QC tested). (1) Sapi E., 2004, Exp. Biol. Med., 229 (1): 1-11. (2) Jang Mei-Huei, 2006, The Journal of Immunology, 177 (6): 4055-4063. (3) Cao, Qi, 2014, Kidney International, 85 (4): 794-806.